It's a matter of ART! Celebrating the many ways the arts can enliven, inform, challenge, fulfill and make listeners better citizens is the core essence of 'The Tarik with The Flag ' It is essentialy Artworks and artists statements about their experiences. Art here is a catalyst for positive change, it stirs the soul. The art fires up the imagination and allows us to reach beyond our mental limits to imagine a better tomorrow. In some the color is profound and while others are devoid of color. The works just might punch you in the jaw that's possible, too... But the thing is it's good to be vulnerable when you're looking at art. You can taste the residue of the previous experience, but when a work of art defeats all our best efforts to dismiss it, that's when you go down on your knees and want to shout about it to everyone. 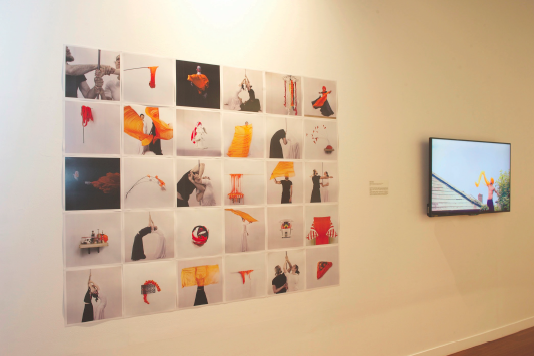 Here are the artists and their depictions & interpretations of all things Malaysian. For me, notions of the Flag are synonymous with all things distinctly Malaysian, from Nasi Lemakand Durian to King and Country. I am much more interested in the place of Teh Tarik that for the longest time has been at the heart of Malaysian politics. Most Malaysians are Mamak politicians and patriots. I grew up in a typical Malaysian home where politics was always part of this Mamak stall supposition and intrigue. Prophecy (2010) for example is the result of a story my father used to tell me after a morning tea and Roti Canai with his friends. Perhaps it was simply meant to help me learn the order of our nation's prime ministers for civics class but I always loved the superstitious audacity of his theory. He called it the RAHMAN prophecy. According to him, the word Rahman in the Tengku's name spelt out the initials for each Prime Minister that would follow his tenure as Prime Minister. R is for Rahman, A for Abdul Razak, H for Hussein, M for Mahathir, A for Ahmad Badawi ending with N for Najib, which seems to imply that with N, the dominance of UMNO and Barisan in governing Malaysia would end. What would happen after N for Najib? Strangely, three versions of the Mahathir panel were also made. The more recent Jemputan or Invitation (2018) is the latest large drawing from my Love Series. Another Mamak stall favorite, this Teh Tarik special otherwise known as Eddin's Law, is the result of the Kacukan Bangsa, or the mixing-of-races theory that perhaps only in this way can we ever become One Nation. 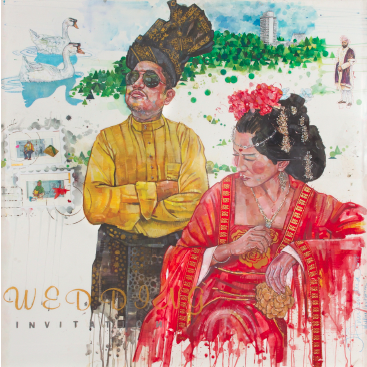 Jemputan references the mythical marriage of a Malay Sultan and a Chinese princess in 15th-century Melaka as a parallel to current events where Malaysians seem ready to cast aside historical divides in a bid for a new Malaysia. Cheng Yen Pheng b. 1982 This is a photography collage complemented with drawings by children integrated in the form of stitching or embroidery. The people photographed are my family members, friends, colleagues, neighbours, students and random passers-by. Despite having different faiths and coming from different ethnicities and parts of the country, we manage to get along well. Recent political events have shown that different colours are being assigned to different agendas. Sometimes too manyÂ¦colours may cause confusion, which is why I chose to eliminate all colours from the photograph, as if to unite all of the subjects presented. The only traces of colour that can be found are in the stitches of the children's drawings. This was purposefully done in view of the children being innocent and pure. A transparent flag can be interpreted as a perspective or invisible flag. The national flag is a symbol and spirit of a country. Eric Hobsbawn proposed the concept of a nation in 1780; it is a relatively new concept. If we look at the history behind the flag, a flag has been used for multiple purposes for a long period of time, but the concept of the national flag only began to be popularized after the 19th century. 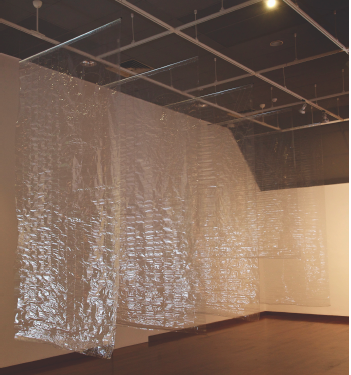 The material of the Transparent Flag (History of the Malay Peninsula) (2017) is tangible and touchable, but visually, it is invisible and difficult to identify. Parallel to the truth, sometimes an objective fact is difficult to identify, as though it was hiding in the dark. The Transparent Flag can be viewed either separately or as a whole. If the audience were to view it from the front, they may see the flag as a strange and foreign flag, rather than a flag that they are familiar with. The flag's content is complex because of the overlapping images from each of the individual flags behind. 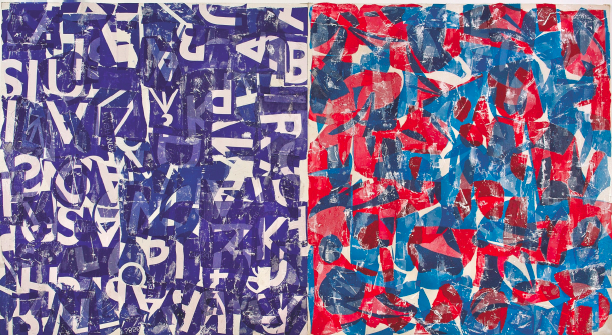 However, if they were to view the piece from the side, the image of each flag becomes clearer, and sooner or later the audience will realize that each flag is not unfamiliar; they are in fact historical flags from the past. No matter what angle they perceive the work, they will not be seeing a single image, due to the nature of the transparent material; they will see overlapping images of different historical flags. We can see this as a metaphor of a country; the accumulation of history creates a nation. Choy Chun Wei b. 1973 This piece evolves around a uniquely encapsulated moment that Malaysians felt and experienced collectively on the 9th of May 2018. I am inscribing that moment via abstract visual expression; I hope to express the communal joy and cheer in a non-obvious fashion. This historical and jubilant time is captured in the positive energy radiating within Malaysians. I captured this through the use of playful abstract rhythms, movements and colours. The hues are deliberately restricted to the Malaysian flag's symbolic colours, yet reconfigured to generate visual variations and rhythm. Fauzan Omar b. 1951 All of us Malaysians believe in exercising our wisdom and rationality when choosing our leaders. No one is questioned. Unfortunately, disillusionment within the ruling party internal disputes, betrayals, broken promises, empty pledges, abuses of power, repressive laws, malicious propaganda and widespread corruption have caused a rise in debt, high cost of living, GST, and which led to its downfall. In the moment of glory and celebration, the election posters, banners and flags both from the ruling and opposition parties littered our environment. I took it upon myself to take them down and keep them with me, as they are significant to me. Dear winners, I congratulate you, but please do not forget the given mandates; do not let them end up in the dustbin. Hamidi Hadi b. 1971 This work is my response to the political atmosphere of the country today. The current issues in turbulent Malaysian politics created a profound effect on the perceptions and emotions of Malaysians. 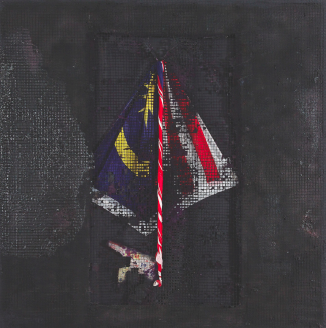 To this end, my works seek to reflect the emotions that run deep, and that as Malaysians it is our right and within our capability to save our flag (country). No. 55, Main Road (2010) is the home of 87 year-old Uncle Chang Ching and it is one of the few inhabited buildings in the two rows of pre-war shop houses that make up the defining centre of Kampung Kepayang, just south of Ipoh. His address aptly reflects the dominating presence of the trunk road. The traffic is relentless and the speed at which the cars and lorries go has meant that the front-rooms of these shop houses seem besieged. Together with other actors such as newer shop lots and housing developments that now exist nearby the road has contributed to the near desertion of this small town. What were once dwellings and businesses, such as medicine and coffee shops, are now mostly abandoned ruins. Seen at a glance rom a passing car, for instance it would appear that Kampung Kepayang, with its shopfronts shuttered or else exposed to the elements, is a virtual ghost town. In fact, the truth is even bleaker: soon the town that one sees now may not exist at all. The two rows of old shop houses have been marked for demolition by the District Council under Section 83 of the Street, Drainage and Building Act 1974. The Council considers these buildings to be structurally unstable and therefore unsafe both for their inhabitants and for passers-by. Another reason and most probably the overriding motivation behind this move- is the fact that the trunk road needs to be widened again. There is a chance that one row will be saved he side opposite Uncle's shop house given the presence of the mosque at the end of the row. The Malay village and orchards further back towards the river will also be spared, but the coherence of Kampung Kepayang, as built up over more than a century, will be gone. Some of the townsfolk are resigned to the loss of this place others don't really care but, having been there for 50 years, Chang Ching is determined to stay put, to live out his remaining days here. The work is spread across three screens: one shows a long tracking-shot across the fronts of shop houses; the centre screen is a static shot of Uncle living room, open to the road; the third screen reveals details of this living room, and of spaces to the rear of it, that are glimpsed down a passage. By reading horizontally across the screens, one image can broaden the understanding of another and there is a sense of concurrency as well as sequence, forming a diffuse narrative. For instance, the sight of notices (telling the occupants to quit), pasted on the fronts of the shop houses in one screen, points up the air of long-standing permanence in the ordered clutter of Chang Ching's possessions and photographs in another. We see the objects collected over many years both treasured souvenirs and the leftover stock of valves and resistors from his days running a radio and TV repair business. At another point, in what hints at a story progression, the man who has been sitting in his living room reading and listening to Chinese songs from his youth closes his book, gets up from his chair and leaves down the passage to the back of his house. The place is viewed primarily from the inside from within the intimacy of a home. The outside world impinges but only through indirect, peripheral intrusions. The sound of traffic is there, always. Less pervasively, less overbearingly, there are the reflections of the traffic the flickers of light that the passing cars and lorries make as they hurtle along the road that cuts through this one-street town. Uncle's stubborn attachment to his shop house, and to the town that is familiar to him, is an act of resistance to the dictates of a short-sighted bureaucracy that is acting to facilitate supposed progress. In No. 55 the joss sticks are lit, a kettle boils, the key is in its usual place by the back door and yet the next shop house along is only a facade. Further down the street there are more abandoned buildings: strangely beautiful and melancholy structures that are littered with remnants of belongings, photographs and altars and with staircases that persist simply as a pattern running up a wall. Each of them invites us to construct for it an imagined past or pasts; with some offering more clues than others. This work emerges from my preoccupation with the hold that places be it a hometown or house, or even their ideated versions, can have over us perhaps because they epitomize our desire for a sense of belonging and continuity as we are forced to become reconciled to a modernity that appears not to accommodate such needs. No. 55, Main Road focuses upon the process of transition whereby place becomes a space but here we see both the persistence of the personal realm, the daily ritual and its fragility in juxtaposition: hard up against the ungovernable forces of the outside world, and indeed against neighbouring shop-lots that have already succumbed to dereliction. 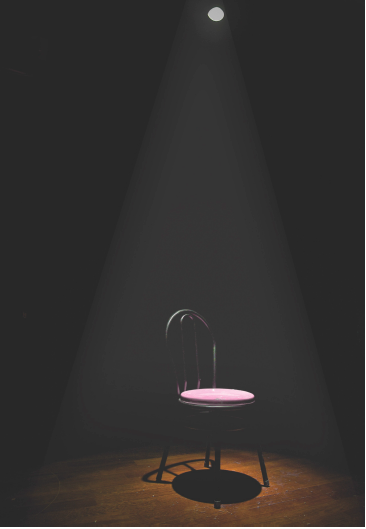 This project invites the public to take a seat on a well-lit chair, taking on a role of a protagonist on stage for a few minutes. For me, every citizen should be proud of belonging to the country in which they live in; proud to participate in its adventures, in its history and in the course of its life. National symbols in particular flags are perhaps the strongest, clearest conveyors of national identity. Through ritual processes, they evoke a shared psychological state of solidarity amongst a particular group. The recurring presence of flags in a physical space activates our feelings by creating bonds between citizens, legitimatizing authority, and motivating patriotic action. 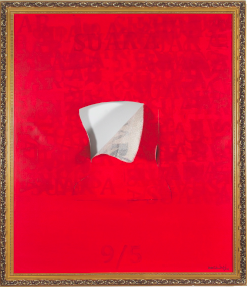 The aura that surrounds cultural icons effectively transcends their qualities as mere objects. Thus, a scrap of an old nation's flag bears the same power as a new, original one. Unlike ordinary objects, the special treatment of cultural icons as living, breathing entities suggests that defining and reaffirming national identity and materiality does indeed matter. It is the particular way in which cultural icons such as flags tap into our psychological nature and dictate a major part of our national identity that I explore as a Malaysian artist, in my latest work The Death of a Nation / The Birth of a Nation (2018). The Death of a Nation / The Birth of a Nation is a political commentary on national identity and race relations in Malaysia. 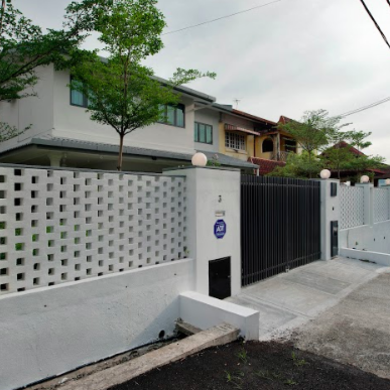 The project began from a small remark about the ... column that has been a dominant fixture in government official forms in Malaysia for as long as anyone can remember. Being conditioned to checking the box and defining oneself as Other Malaysians have grown indifferent to the implications posed by this question. Little have wondered or even questioned the challenges provoked by such a presumption. Yet, as I note, the race category begs to question what constitutes a Malaysian. Is one race more Malaysian than another? Aren't we all Malaysians regardless of race, creed, and religion? In a sense, the race question looms on every Malaysian's mind every now and then, despite government's efforts to forge a national identity; the race box reinvigorates racial ambiguity and discrimination. My grandfather arrived in Malaysia a century ago. He was a proud turbaned man who served as a police officer under the British, the Japanese and during the communist emergency, as did my uncles and my father. Through these photographs and video, I reflect on a century of Sikhs and their undeniable but little appreciated service to Malaysia. I explore this through a vocabulary of movements, from the perspective of my grandfather's relationship with his turban and consequently his God, prioritising his gestures and their historical weight in worship. The film and photographs are choreography of pain and prayer, an exploration of the possibility of being alive through movement and a relationship with an emergent nation and its flag. I question time, space, place, memories and historical narrative through a choreographic practice. A few Malaysia(s) (2018) is the reality to the often-cited aspiration of Malaysia. However noble the aspirations of Malaysia is, it is vital to recognise the differences that exist in Malaysian society, the dividing lines in cultural, social and economic issues. Aspirations from the ruling class need to be anchored by the realities of what the Malaysian masses face in everyday life. Without it, the concept of Malaysia is reduced to mere platitude. 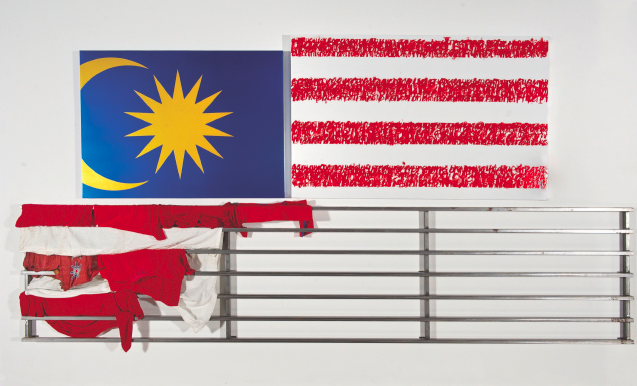 The bottom piece of this triptych is a metal rack on which I invite the audience to hang their clothing, fabrics or any materials that are red or white in colour, to complete the imagery of the Malaysian Flag. 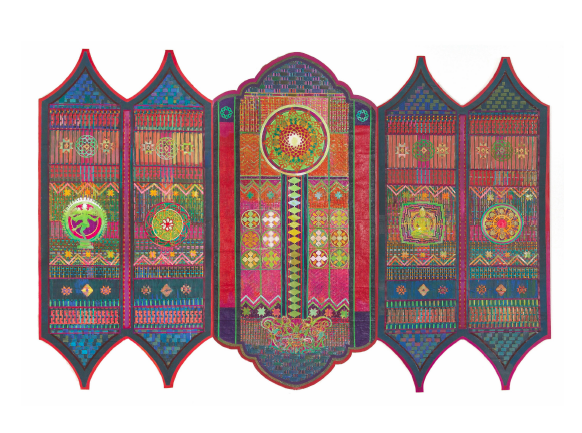 Even though the 3 panels do not sit neatly together, I believe that the participation of the audience in completing the work will show that beauty does not always come in neat packages a metaphor for the diverse, idiosyncratic yet beautiful nature of Malaysian society. The belief in God constitutes the first principle of the Rukun Negara. It speaks volumes of how profoundly spiritual worldviews shape our values, beliefs and norms as citizens living in a multi-racial and multi-religious society like Malaysia. As adherents of our respective religious traditions whether Islam, Hinduism, Buddhism, Christianity, etc. we are not only enjoined to perform regular religious rites and rituals in order for our souls to be divinely guided, blessed and rejuvenated. We are also commanded to conduct our lives in this impermanent material world through a virtuous and righteous manner. As God-centred and God-fearing Malaysians, we are expected to be morally upright, fair and just with one another; compassionate, considerate and above all, moderate in whatever we do, think and say. All forms of extremism, fanaticism and violence are qualities most Malaysian abhors. Therefore, it is not uncommon to hear foreign tourists expressing their disbelief in seeing the reality that Malaysians, regardless of their skin colour or religion, working and living together with unity, harmony and peace. 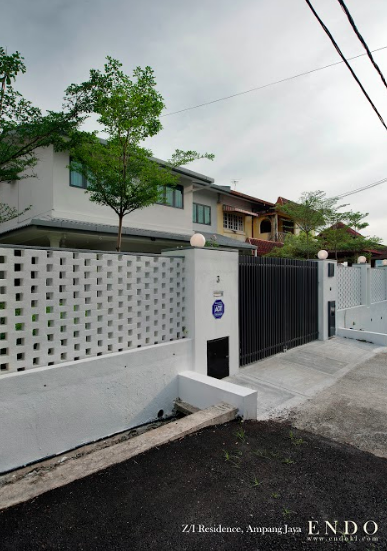 Furthermore, it also not unusual to discover different houses of worship throughout Malaysia the mosque, temple and church can all be built along the same road if not in close proximity. Finally, the sight of Malaysians of different racial and religious backgrounds sitting together enjoying their glasses of Teh Tarik whilst watching football games at a local Mamak stall, has become such a commonplace spectacle! For me, it is not difficult to find an explanation for this common place phenomenon. On a large scale, as Malaysians our world-view, self-view and attitude towards others are shaped and guided through the principles of life that are spiritually and morally enlightened. As the national flag was waved, the joyful news spreads across the nation. The spirit of the nation is lifted. This spirit is lifted high up on the ÃâÃÂ¦sycamore tree. The glory of the nation and the encounter of a gracious transformation have arrived. The climb to achieve greatness continues as we are on the sycamore tree or does it? 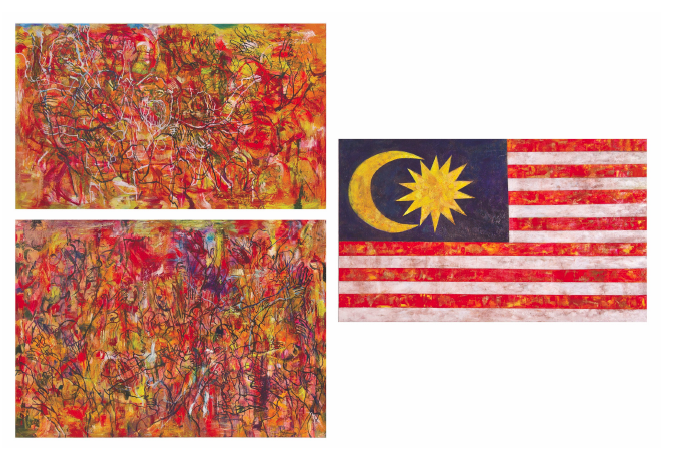 The Tarik with The Flag will be showing from 23 July to 17 September 2018 at the National Art Gallery, Malaysia.